Around here chickens are more than farm animals, they are beloved family pets- pets who provide breakfast! But really, poultry is serious business at The Grange. Your flock’s diet is your diet and that’s really important. That’s why we carry a range of feed types; Natural feeds from Purina and Payback, GMO-free feed from Renew and Organic GMO-free, Soy-free whole grain diets from Scratch and Peck. If you don’t know what to feed our team of Poultry Enthusiasts are ready make a decision about what is best for you and your flock! 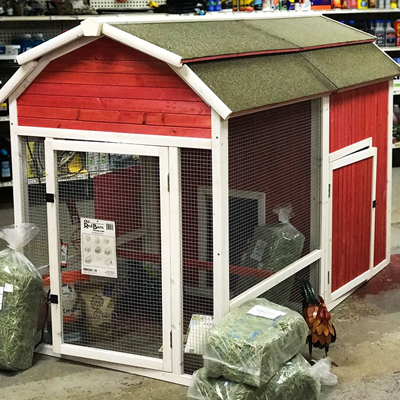 In addition to feed, we have supplements, feeders, treats, bedding materials and even chicken toys! Whatever your flock needs, we have the supplies and the experience to help. Don’t miss our baby chicks! Each year, from Late February thru early May, we receive weekly shipments of baby chicks, ducklings and turkey poults. Expand your flock, to keep your egg production at optimal levels.